ETD (Eustachian tube dysfunction) is estimated to effect up to 5% of the adult population. 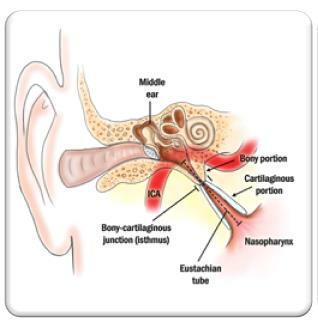 Narrowing of the Eustachian tube causes patients to experience ear pain, pressure, fullness, popping, ringing, or muffled sounds in the affected ear(s). Normally, the Eustachian tubes are working properly so you don’t notice them at all. Anything that prevents the tube from opening can cause Eustachian tube dysfunction. Eustachian tube dysfunction may occur when the mucosal lining of the tube is swollen, or does not open or close properly. It can occur after the start of a cold and other nose, sinus, ear and throat infections. When they are not working properly, the patient can possibly feel the following symptoms: muffled hearing, fullness of the ear, pain in the ear, inability to equilibrate middle ear (ME) pressure, tinnitus, and dizziness. Persistent Eustachian Tube Dysfunction can be associated with several serious conditions. 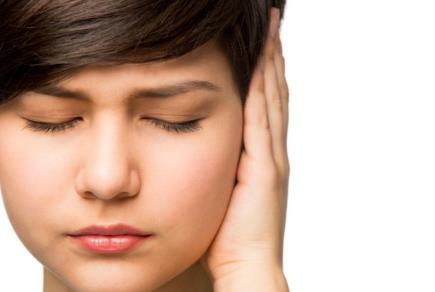 Long-term ETD has been associated with damage to the middle ear and the eardrum. Otitis media with effusion, atelectasis of the ME, adhesive otitis, perforation of eardrum and Cholestetoma. Now, your physician has another tool (or option) in treating Eustachian tube dysfunction (ETD). The ACCLARENT AERA™ Eustachian Tube Balloon Dilation System is the first device in the US indicated to dilate the Eustachian tube. 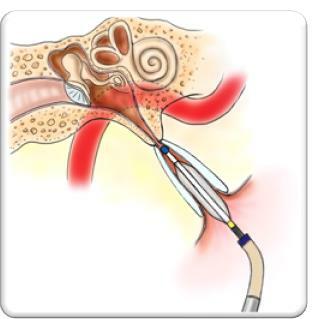 The ACCLARENT AERA™ system uses a small balloon to treat persistent Eustachian tube dysfunction (ETD), a condition in which pressure, pain or clogged or muffled sensations occur in the ear. With the ACCLARENT AERA™ system, a doctor uses a catheter to insert a small balloon through the patient’s nose and into the Eustachian tube. Once inflated, the balloon opens up a pathway for mucus and air to flow through the Eustachian tube, which may help restore proper function. After the Eustachian tube is dilated, a doctor deflates and removes the balloon. Results from clinical studies demonstrated a 99.7 percent technical success rate in Eustachian tubes dilated. Additionally, there were zero reported serious device- or procedurerelated adverse events. The ACCLARENT AERA™ Balloon is inflated to dilate the Eustachian Tube to relieve the symptoms of ETD.